And the hearts just keep on coming! I had some leftover heavy cream from some insanely good mushroom pasta I made last night, and leftover buttermilk from something else so I did what any reasonable person would do - I made Whoopie Pies! 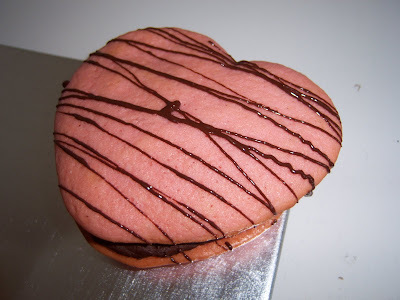 And not just any Whoopie Pies, I made GIANT pink heart-shaped whoopies - cuteness! To get the cookies the right shape, I made a paper template and traced the shape onto my Silpat with an edible marker, then I piped the cookie-cake batter onto the pan. The filling is Nick Malgieri's ganache from Perfect Cakes, which I just got from the library. I'm a big fan of his How to Bake. The chocolate piped on the top is these awesome Ghirardelli chips. They melt smooth and thin so you don't have to add shortening, oil, or Paramount Crystals to make the chocolate drizzleable. 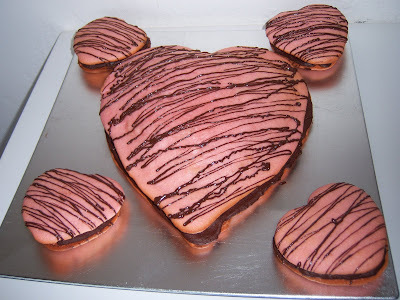 I hope your Valentine's Day is sweet!